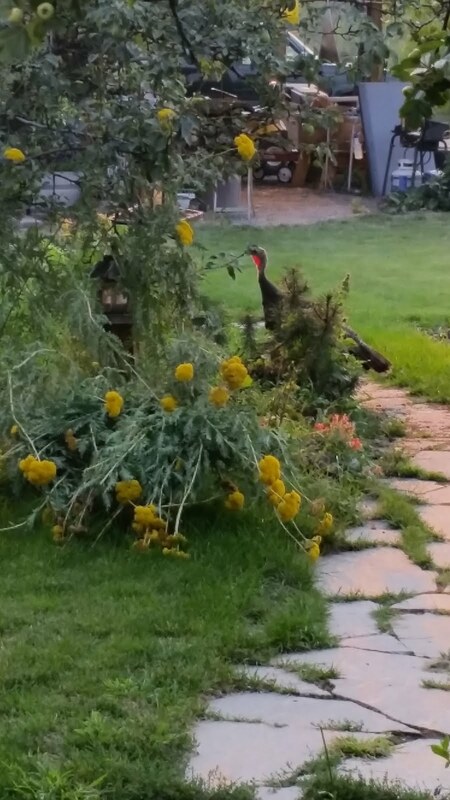 We always have some oddity coming to our feeder. 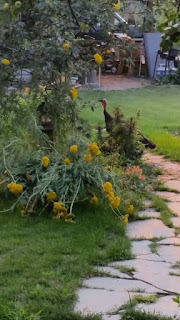 This year it is a wild turkey with 4 young ones. Considering where we live what is actually odd is that none have come before. I think I may have broken Google's cloud trying to get a picture of all of them together. So far, no luck. We figured out she comes up the deck steps to look at the "other turkey" in the sliding glass door. Maybe turkey motherhood is a lonely business. Maybe she was hoping to schedule a play date and get some relief. On the other hand hummingbird mothers apparently give the old heave ho and let everybody figure it out on their own. We have had several smaller than smalls trying to figure out what to do with a hummingbird feeder. Mostly, they just sit on it and tap at the glass. Again, I am expecting Google to resort to using a telephone to get me to stop trying for the perfect picture. "Ms Drye, please knock it off with the bird pictures, you put a crack in our cloud! It can't take much more!"